Here is the Vine Daily Show put up with 50 Fox News lies in 6 seconds (with a link below so you to read them all if you don't want to tap the images over and over). 1. "In July 2010 the government said small businesses -- 60 percent -- will lose their health care, 45 percent of big business and a large percentage of individual health." 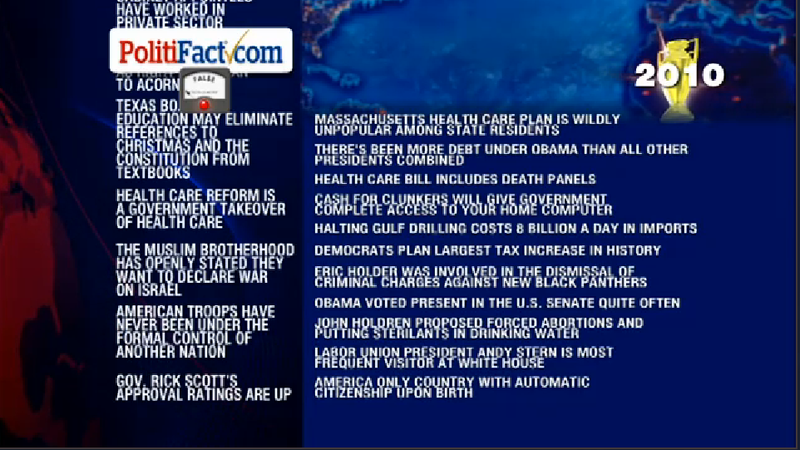 Read more of the Fox News lies on the Politifact site. Below are the 21 claims Stewart referenced in his comedy bit -- two "Lie of the Year" awardees, five Pants on Fires and 14 False ratings. Here is the full list, with links to our original item, in the order in which Stewart named them.